Say Hello to my most used nail products. These two varnishes are used every single time I paint my nails. Whether it be with bright colours, glitter topcoats or french manicures, these are the perfect layers over and under the magic. 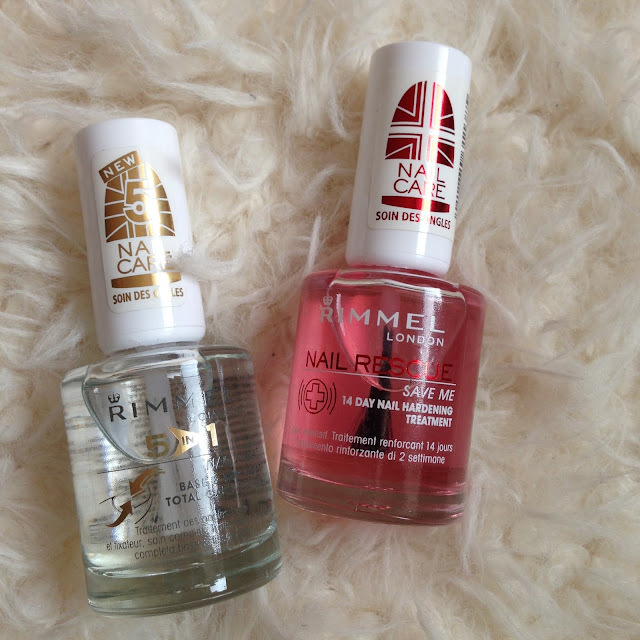 The nail rescue I apply to my bare nails as a treatment for worn and damaged nails. It helps to harden and restore them to their former glory, and it truly does work. I would then apply a colour, glitter or whatever I am feeling that day and then finish off the nails with the Rimmel 5 in 1 varnish. The clear top coat adds a lovely glossy finish to the nails whilst also protecting them from chipping and locking in any colour or glittery top coats. It also contains treatment properties and helps to harden and save the nails, so this is definitely a top coat with an added bonus. Without applying these two products, my nails would be weak and brittle and nail varnish colour would not stay on anywhere near as long. Without a doubt, these are two products that my nails couldn’t live without. What are your must have nail products?